WASHINGTON (AP) — Americans and their lawmakers are dramatically out of sync on health care, with large majorities of people looking for bipartisan cooperation that's nowhere in sight. A new Associated Press-GfK Poll finds a widespread hunger for improvements to the health care system, which suggests President Barack Obama and his Democratic allies have a political opening to push their plan. Half of all Americans say health care should be changed a lot or "a great deal," and only 4 percent say it shouldn't be changed at all. But they don't like the way the debate is playing out in Washington, where GOP lawmakers unanimously oppose the Obama-backed legislation and Democrats are struggling to pass it by themselves with narrow House and Senate majorities. More than four in five Americans say it's important that any health care plan have support from both parties. And 68 percent say the president and congressional Democrats should keep trying to cut a deal with Republicans rather than pass a bill with no GOP support. Leaders of both parties in Congress say that's not how it's going to work out. After a year of off-and-on negotiations, Republicans adamantly oppose Obama's plans. The White House and Democratic leaders say it's now-or-never for a health care overhaul, which would cover an additional 30 million Americans, require almost everyone to buy health insurance and impose new restrictions on insurance companies. The Democrats' plan relies on parliamentary rules that bar Senate filibusters. That would enable Senate Democrats to pass a companion health care bill — which House Democrats are demanding — with a simple majority. Democrats control 59 of the Senate's 100 votes, one shy of the number needed to stop GOP filibusters. The new poll underscores Obama's struggles to wrest control of the health care debate from Republicans, who couch his efforts as a government takeover and costly intrusion into private lives. Many of his allies are baffled, because Americans clearly want change, and some of the individual components of the Democrats' health care agenda seem popular. Moreover, the public has not embraced the Republicans' overall approach to legislating, giving lower approval ratings to GOP lawmakers than to Democrats, although both parties fare badly. 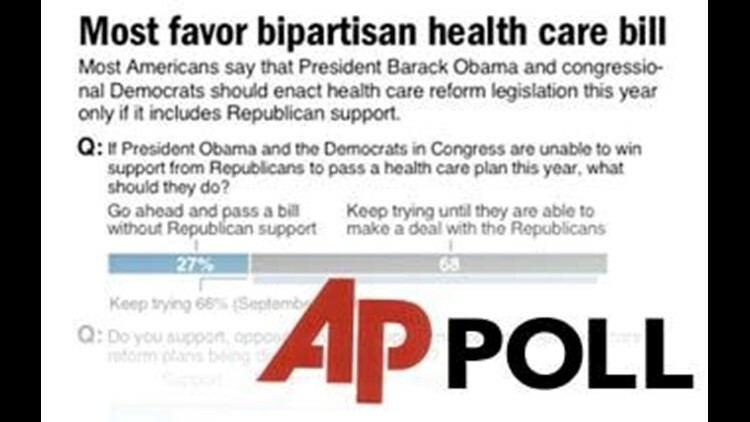 In the AP-GfK Poll, 43 percent of those surveyed said Obama and Congress should keep working to pass health care this year, while 41 percent said they should start from scratch. On Capitol Hill, the Republicans favor that new-start approach; Democrats say that's just a way to stall the effort to death. Sandy Stemm of Springfield, Ore., would seem the ideal target for Obama's appeal. She's a Democrat and former bakery manager who recently lost her job and health insurance. But Stemm, 47, doesn't like the idea of congressional Democrats going it alone on health care. "I think it's important to come to an agreement," she said in a telephone interview. "We're all in this together, whether we're Democrat or Republican." John DeHority, a Democrat from Rochester, N.Y., supports Obama's effort and thinks Republicans have "made a travesty of the process." But he suggested the GOP is winning the political battle. "I think passing the bill in its current form would be political suicide for Democrats," said DeHority, 56, a researcher in health care imaging. He said he thinks the proposed changes would fail because they would not control costs, and "Democrats will take the fall for that." Obama's own message, sometimes shifting, seems unpersuasive to many. Over the past year, he has moved his emphasis from the moral implications of improving health care to the cost-cutting possibilities to the impact on the deficit. In a fiery speech near Philadelphia on Monday, he renewed his harsh attacks on insurance companies, which he says are overcharging people and denying coverage to less-desirable clients. The president heads to St. Louis on Wednesday to press his case for overhaul, even as major businesses launch a multimillion-dollar ad campaign to undercut the legislation. The result is a message mishmash that leaves many people unsure why they should support Obama's plans, said Kathleen Hall Jamieson, an authority on political communications at the University of Pennsylvania's Annenberg center. "They didn't make those mistakes in the campaign," she said, calling Obama a master at staying on message as a candidate. "Communications scholars are shaking their heads," she said. White House communications director Dan Pfeiffer said Tuesday that Republicans "have played politics with health reform from the very beginning." Also, many Americans have been turned off by the political dealmaking that took place in Congress, Pfeiffer said, and "the insurance industry has spent millions demonizing health reform." More spending is on the way. Major business groups Tuesday announced a multimillion-dollar ad campaign criticizing Obama's proposals. Health insurance companies are among those paying for the ads, scheduled to air on cable channels nationally and then in 17 states that are home to moderate Democratic lawmakers. House Democratic leaders are waiting for final legislative language before launching an all-out push to enact the health care bill that the Senate passed on Christmas Eve. The House's somewhat different version passed 220-215, with 39 Democrats voting against it. Presidential adviser David Axelrod told supporters on a conference call Tuesday that "what happens in the next 10 days will be critical." He asked them to talk to friends and neighbors to boost momentum. The AP-GfK Poll was conducted March 3-8, by GfK Roper Public Affairs & Media. It involved landline and cell phone interviews with 1,002 adults nationwide, and had a margin of sampling error of plus or minus 4.2 percentage points. Associated Press writers Natasha Metzler, Ann Sanner and Erica Werner, and AP polling director Trevor Tompson and news survey specialist Dennis Junius contributed to this report.